Before the holiday even began, St. Patrick’s Day celebrations made headlines when the National Post published an article saying Laurier cancelled the holiday from its campus. In a statement, Students’ Union president and CEO, Olivia Matthews, cleared up any concerns. While the St. Patrick’s Day festivities still went on, merchandise was banned from the Bookstore and extra security was present around the campus in an attempt to “shift the culture” around the holiday. Over 5,000 students and Waterloo visitors celebrated on Ezra Avenue while numerous security guards and officers were patrolling the area making sure students were drinking responsibly. Fortunately there were no major incidences reported during the day. In sponsorship with the Mennonite Central Committee, Wilfrid Laurier University sponsored three Syrian refugee families through the blended-visa sponsorship program last November. On January 15, Wilfrid Laurier University welcomed one of the three sponsored Syrian refugee families to arrive in Canada. The first family to arrive was brought to Kitchener where an Arabic volunteer was able to explain how things worked in the area. The family was also able to set up bank accounts and OHIP cards. The parents are also attending English as a second language classes to be able to secure employment. Laurier also raised $85,000 from the Laurier community for the program. On February 4, the Students’ Union announced Tyler Van Herzele, a fourth-year concurrent education student, as its first-ever president from the Brantford campus, beating fellow candidate, Waterloo student Tyler Murdock, with 55.25 per cent of the student vote. A total of 4,315 Laurier students voted in this year’s elections, making for a 26.14 per cent turnout rate, a two per cent increase from last year. Currently, Students’ Union president Olivia Matthews is in the process of training Van Herzele while he transitions into his new role. Laurier students will be able to officially call Van Herzele their Students’ Union president when he begins his job on May 1. Throughout the months of December and January, there was an increasing amount of reports regarding hate crimes on the Waterloo campus. Most of the hate crimes included anti-Semitic and anti-black graffiti seen on various campus buildings. Special Constable Services, along with the Diversity and Equity Office, made strides in an effort to support students and prevent hate crimes similar to these in the future. The DEO also offered an event called a Play for Peace, in which students could be supported by campus community members who could speak about the campus climate Laurier hopes to uphold. Since January, there’s been a low rate of hate crimes reported on campus. After a long and dramatic decision period, the board of governors passed the motion to withdraw from their participation in the Prime Minister Statue Project. 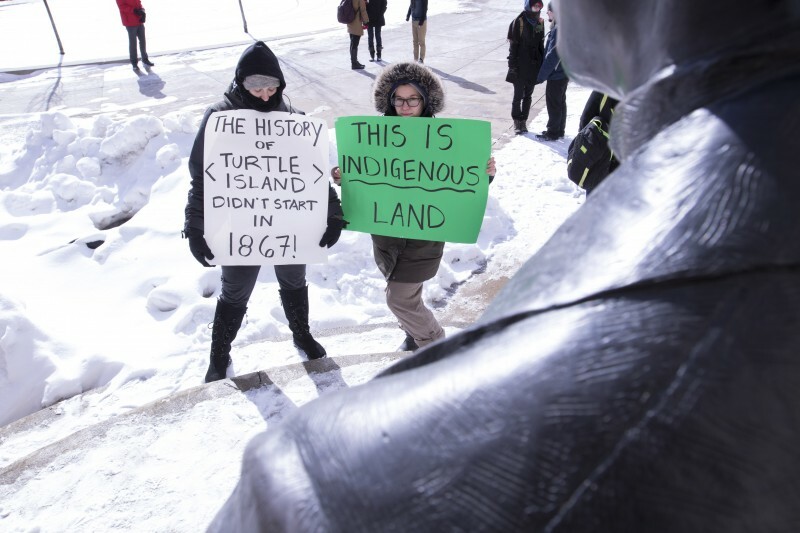 A statue of John A. Macdonald which was unveiled in July 2015, stirred controversy as organizations and individuals at Laurier felt the project didn’t represent cultural diversity. “Stop the Statue Project” petition came as a reaction. In November, Laurier president Max Blouw created a special advisory committee to provide recommendations to the university Senate and board of governors on how they should move forward. The end of the project came on February 11 when the governors passed the motion with 26 in favour, three opposed and one abstention.